Despite a variety of free flaps that have been described for creation of the neophallus in gender affirmation surgery, none present an ideal solution. We evaluated our patients and outcomes after gender affirmation phalloplasty using musculocutaneous latissimus dorsi free flap. Between January 2007 and May 2017, 129 female transsexuals, aged 20–53 years (mean 24 years) underwent total phalloplasty using latissimus dorsi free flap. Urethral lengthening was performed by combining a vaginal flap, labia minora flaps and a clitoral skin flap. Suitable sized testicular implants are inserted into the new scrotum. Penile prosthesis implantation, additional urethral lengthening and glans reshaping were performed in the following stages. The mean follow-up period was 43 months (ranged from 13 to 137 months). There were one partial and two total flap necrosis. The average size of the neophallus was 14.6 cm in length and 12.4 cm in girth. 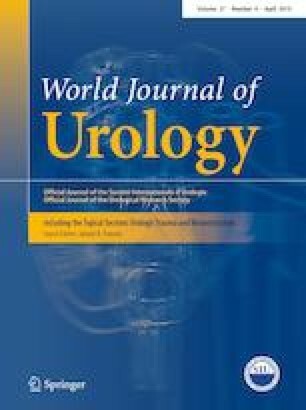 Total length of the reconstructed urethra during the first stage ranged from 13.4 to 21.7 cm (mean 15.8 cm), reaching the proximal third or the midshaft of the neophallus in 91% of cases. Satisfactory voiding in standing position was confirmed in all patients. Six urethral fistulas and two strictures were observed and repaired by minor revision. Malleable and inflatable prostheses were implanted in 39 and 22 patients, respectively. Musculocutaneous latissimus dorsi flap is a good choice for phalloplasty in gender affirmation surgery. It provides an adequate amount of tissue with sufficient blood supply for safe urethral reconstruction and penile prosthesis implantation. This paper is supported by Ministry of Science and Technical Development, Republic of Serbia, Project no. 175048. MLD: Project development, Data collection, Manuscript writing. MB: Data collection and analysis, Manuscript editing. VK: Project development, Data analysis. BS: Data collection, Manuscript editing. MB: Data analysis. SK: Project development. ZK: Manuscript editing. GK: Project development.